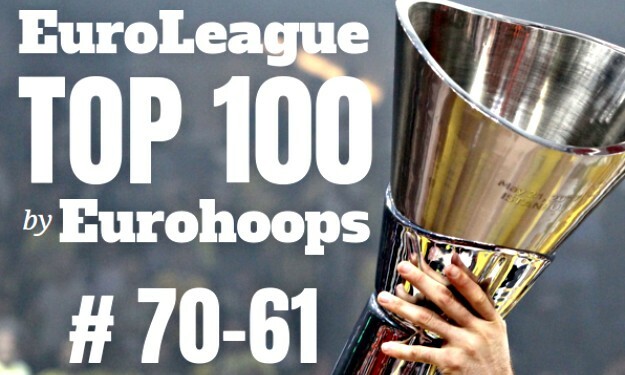 The countdown towards the top spots of our “EuroLeague: Best 100” selections continues with the players ranked between #70 and $61 positions. Let’s get started for another season! A concept established in Europe by Eurohoops.net regarding the top league and which is, by nature, subjective! It can generate disagreements, objections, agreements, and, above all… interest! In recent seasons, the choices are becoming even harder and more torturous to make! Because all the good players are packed in 16 teams and the top clubs in Europe have greater depth in their rosters in order to manage the new format of the EuroLeague and the levels of energy it requires. Which makes the ranking very difficult and leaves out of the list of the EuroLeague’s Top 100 players, athletes that could have easily been among our choices. As we wrote last season, there are at least 50 players who could have been objective and subjective choices, especially between 100 and 80, and we ask for your understanding because, unfortunately, there is not enough room for everyone. However, we promise that after the first 15 rounds, when we will have a substantial sample by the end of the first phase, we will rank the Top 100 players based on their performance up to that point, and so, any possible mistake will be rectified! You are familiar with our criteria from previous seasons. The only footnote is that, some players who are coming back from a long absence due to injury (for example, Zoran Dragic) were not ranked and that this will happen during the season. With the exception of Sergio Lull, who is in a category of his own! The individual quality of the player IN COMBINATION with the role and playing time we anticipate he will get in his team. The strength of the club he plays for. The players of the teams that are in the Top 8 and that are title contenders every season always have an edge because they combine individual quality with their club’s high aspirations. What each player has achieved in his career in the EuroLeague combined with the prospects he has for the 2017-18 season. So let’s begin the countdown to the top.